The Kansas City metro’s unemployment rate dropped to the lowest point in three-and-a-half years in September. Without seasonal adjustment, the rate dropped to 6.1 percent, down from 7.0 percent in August. We know there are seasonal patterns in employment, and history tells us that unemployment rates that aren’t seasonally adjusted typically do drop in September, although a drop of nearly one whole percentage point is rare. We get a more accurate assessment when we look at the seasonally adjusted data that is now available for metro areas from the Bureau of Labor Statistics. Even with seasonal adjustment, the Kansas City metro saw a significant drop from August to September, from 6.9 percent to 6.6 percent. Comparing the local metro unemployment rate to the national rate gives an interesting picture. 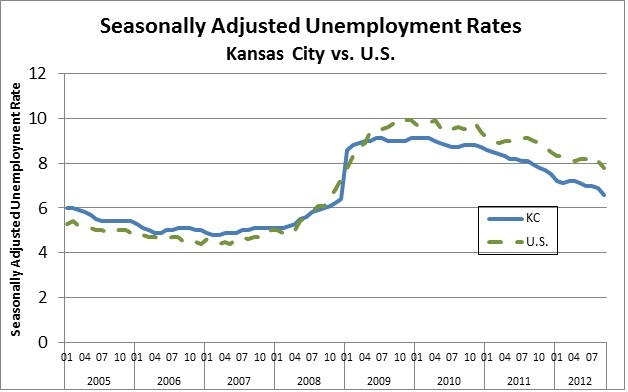 The chart below shows seasonally adjusted unemployment rates for the KC metro and the U.S. Since mid-2009, the Kansas City unemployment rate has dropped below the national rate and the gap appears to be widening. The not-so-good news is that this lower unemployment rate is mostly due to a shrinking regional labor force, not to a big increase in the number of jobs. Regional employment grew by just 723 in September, while the labor force declined by nearly 3,000. Still, the positive take-away here is that our local workforce picture appears to be healthier than the nation’s. This bucks the trend that persisted throughout much of the 2000s.